Home » Attend or Sponsor an Event » 2018 Iron Sommelier & Brewmaster Event Celebrates 5th Anniversary! 2018 Iron Sommelier & Brewmaster Event Celebrates 5th Anniversary! We are so excited for our 5th anniversary of the Iron Sommelier and Brewmaster Event! This lively event provides a unique approach to wine and microbrew tasting paired with food. Guests vote for their favorite wine or microbrew pairings while enjoying six (6) gourmet small bite courses by Executive Chef Steven Swanson of the award-winning Nectar Catering and Events (Spokane). A 2002 graduate of Newport High School, Chef Steven went to culinary school at Arizona Culinary Institute in Scottsdale. 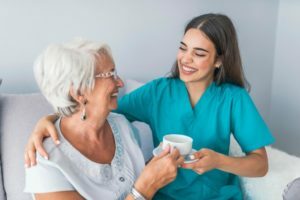 Chef has worked at Twigs Bistro and Martini Bar and the Coeur d’Alene resort locally and in Seattle worked at Microsoft Lancer Catering and Everett Golf and Country Club. Chef Steven’s culinary creativity and passion add a unique touch to Nectar menus that truly set them apart. Sandpoint-based MickDuff’s Brewing Company (2017 Brewmaster) will face off against Spokane’s No-Li Brewhouse for the 2018 Brewmaster title. Competing wine distributors vying for the Iron Sommelier title are Charlie Walker from Vehrs and Star Jensen from Idaho Wine Merchant. Spirited pourings and happy hour snacks are provided by The Beardmore Bistro Wine Bar & Tap House . This event welcomes both novice and expert tasters…no experience necessary! Non-alcoholic options are complimentary for those who choose not to participate in the tasting. After an impressive debut appearance at last year’s event, Kicho Forrest returns this year, featuring live acoustic guitar and vocals. The 2018 Iron Sommelier & Brewmaster Event benefits the Newport Hospital & Health Services Foundation’s Healthy Kids Snack Bag Program, Reach Out & Read and other Foundation hospital programs. Don’t wait to by your tickets this year…it’s an epic event and will sell out quickly! Tickets are $60/person (tables of 8, $480) and payable upon reservation. 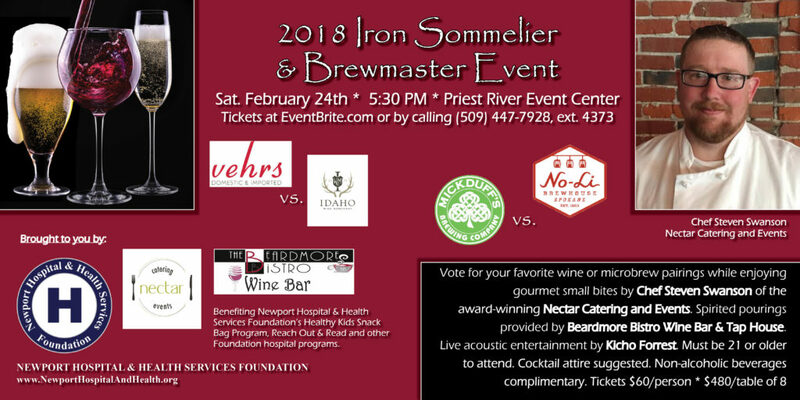 Tickets for the 2018 Iron Sommelier & Brewmaster Event are extremely limited and available on EventBrite.com or through the Foundation by calling (509) 447-7928, ext. 4373. Guests must be at least 21 years old to attend. Doors open at 5PM. Suggested dress code is cocktail attire. 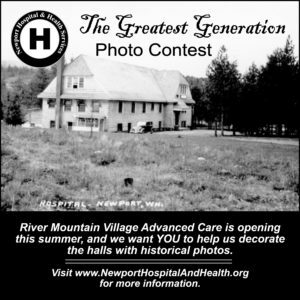 NHHS Foundation is a 501(c)(3) organization.